This blog discusses many of the possible TV aerial and satellite mounting brackets that are available to you. 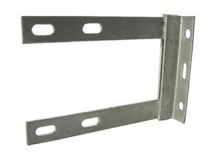 Each of them has their own unique purpose, some are very common and are installed regularly like 9" wall brackets and 8" cradle lashing brackets and others are not so common, like the self supporting bracket or the through the roof mount. By the end of this blog you should have an idea what type of bracket that you should use for your own aerial, antenna or satellite dish installation. This blog contains many of the relevant & most commonly used brackets for mounting antennas. It does list in detail many of the most common but it doesn't name every single bracket that is available to you. This blog would just go on forever if it did. For instance it's not common but there is an 18" cradle lashing bracket on the market, together with a 12" corner lashing bracket. These haven't been listed as I believe that you would be better off to use a double lashing bracket and 13.5" cradle lashing bracket in both instances. There are also other varieties of wall brackets and different sized L arms, patio mounts etc. A swivel bracket is used for the mounting of TV aerials within lofts. 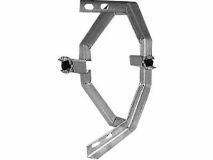 Swivel brackets are a good choice as they allow the bracket to be mounted in a variety of positions and allow the mast to be moved into position.This is perfect for when fixing positions are limited and spaces are light like within lofts. A heavy-duty fascia is similar to a swivel bracket except that have a slightly reduced range of motion when fixed in position and more suitable for external installations. 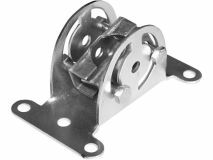 The Heavy Duty Fascia Bracket can be used in lofts or on walls and fascia with a short 1” diameter mast or J mast. It is preferable however when installing on fascia’s or walls that a 6” wall bracket or larger be installed if space allows it. 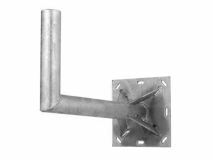 Wall brackets for TV aerials come in a a few different shapes and sizes. When picking a wall bracket for your TV aerial or satellite dish I recommend that you purchase one that is galvanised, or at least anodised steel rather than just painted steel as the latter will quickly begin to rust, especially in seaside areas. 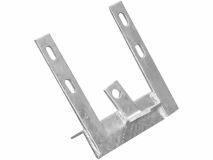 There are two main types of TV aerial wall brackets these are the single piece wall brackets and T & K wall brackets which are a two piece bracket. 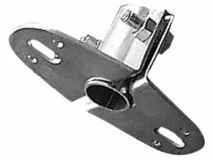 A 6” wall bracket would most commonly be installed onto soild fascia boards with a short mast, they can also be used on brickwork with small aerials where extra height is not required and in lofts to support larger aerials where a swivel bracket or heavy duty fascia bracket is not strong enough where there is no wind loading. Most 6” wall brackets will accept a mast of up to 1.5” diameter held in position with small 'U' bolts. 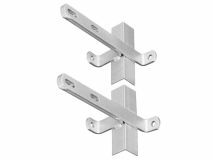 A 6”x 9” wall bracket is the same as a 6” wall bracket except that the bracket arms extend further away which may be required to gain clearance for a mast to be inserted. Most commonly this would be to clear tiles which extend over the sides of the fascia when mounting a TV aerial onto a fascia or to help a TV aerial fit when it otherwise wouldn’t. A 9” wall bracket would most commonly be installed onto a brickwork/ Render or wooden surfaces; however, they can also be used on large fascia boards for a stronger fixing. 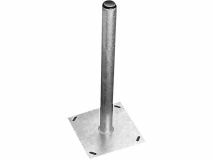 A 9” wall bracket can support a mast height of up to 4’ and accept a mast diameter of up to 2”. A 12” wall bracket is essentially the same as a 9” wall except that it will allow for a larger mast to be inserted and extends slightly further away from the wall to allow for extra clearance. 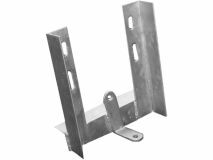 A 12” wall bracket can accept a mast up to 6’ in height and 2” in diameter. A 12”-18” wall bracket accepts the same height and diameter mast as a 12” wall bracket except that it has an extra 6” clearance to help clear fascia’s, guttering and soffits. T & K wall brackets are a two piece, a 'T' bracket and a 'K' bracket because of the way they look. 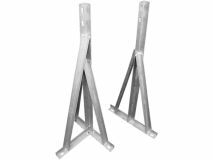 These have the advantage of being installed separately to create the fixing distance and spacing that you require to support the size of the mast that you're installing. 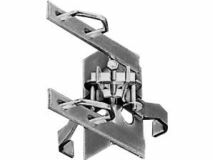 T & K wall brackets are used for installations where a large mast is required which is usually around 8' or more, or when a clearance of an obstruction needs to be achieved like for clearance of fascia's, soffits and guttering. This is why there are so many different size types as the depth of these are not always the same so different size brackets are sometimes required. 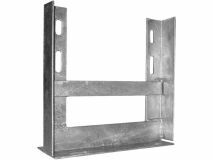 I recommend when choosing T & K wall brackets to install the smallest size that you require once you have a clearance of an inch or two of any obstructions as they can look silly when unnecessarily installed too far away from the wall. 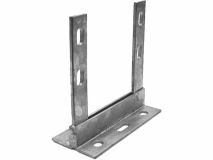 12” T and K wall brackets allow for large masts to be installed as the bracket spacing can be installed at a distance to support the mast. They do however not have a great clearance which is often fine for mounting onto gable ends of a property, but not good for installing on walls where guttering needs to be cleared. 18” T and K Wall Brackets allow large masts to be installed as also have a clearance deep enough to clear most fascia, soffits and guttering. If extra clearance is still required 24” T and K Wall brackets give 6” extra clearance to allow clearance on deep fascia’s and soffits. If need to gain clearance on the deep fascias and soffits, 30” T and K wall brackets offer a further 6” clearance over 24” T and K wall brackets. For the very deepest fascia and soffits. 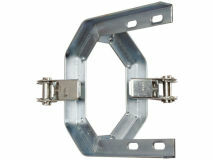 36” T and K wall brackets offer an extra 6” clearance on 30” T and K wall brackets. These are considerable heavier than the other types of T & K wall bracket so installation will be a little bit trickier. The following Chimney Brackets are installed onto a corner of a chimney stack and secured in place with a lashing strap or lashing wire installed around the chimney with the tension of the wire holding the bracket in place, for this reason you should always inspect the condition of the chimney stack before installing a bracket for an antenna. Drill and expansion fixings should never never be used on chimney stacks as most chimney stacks are only a single skin brick and together with wind loading on the aerial and aerial mast are likely to remove the bricks clean from the chimney. 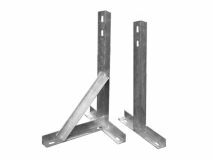 A 6” corner lashing bracket can support a mast of up to 3’ and 1.5” in diameter. 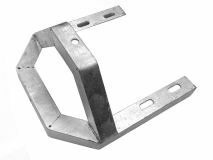 An 8” cradle lashing bracket would be preferable to install rather than a 6” corner lashing bracket as it offers a stronger fixing but this is not always possible if there is limited space on your chimney stack. A 6” corner bracket can fit in a space of 6 standard size bricks. 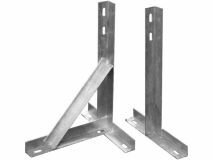 A 7.5” Corner Lashing Bracket can support a mast of 4’ and 2” in diameter. 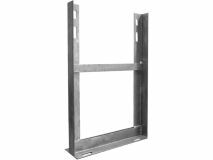 An 8” cradle lashing bracket would nearly always be preferred and installed instead of a 7.5” corner lashing bracket. These are helpful however for 3 brick spacing's where often a 8” cradle cannot fit. Cradle brackets are the preferred method of fixing to chimney stacks. This is because the brackets its further around the corners of a chimney stack offering a stronger fixing. 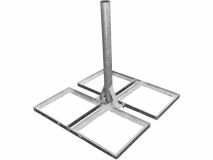 An 8” cradle can support a mast of up to 4’ and 2” in diameter. These typically need a brick spacing of 3 bricks to be able to fit, this isn’t always the case on some chimneys however the actual size and spacing of the bricks will differ meaning that a 7.5” corner lashing bracket may be required. 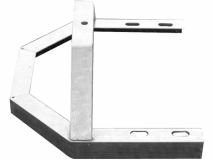 A 13.5” cradle lashing is essentially the same as an 8” cradle lashing bracket except that it can safely support a mast of up to 6.5’ in height and 2” in diameter. A 13.5”cradle lashing bracket fits in a 4-brick spacing. 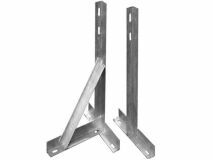 If you need to support a mast greater than 6.5’, double lashing brackets should be installed to give a bracket spacing size capable of supporting a larger mast. 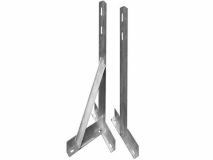 Double lashing brackets are two separate brackets that can be installed to create the fixing size that you require. They are capable on supporting 12’ masts but before installation you use ensure that the chimney is strong and capable of supporting the mast height. There is another method of fixing aerials to chimney stacks and that is via a chimney ratchet strap, which works the same way as a lashing bracket and wire where the tension of the strap keeps the bracket in position. A benefit of using a lashing strap is that corner plates do not need to be installed to each corner of the chimney stack to protect it. This makes ratchet straps perfect for installations where installing corner plates would other wise be problematic. They also have another advantage in the sense that they are virtually a tool-less installation making, with the exception of a cutting tool like scissors to cut the ratchet strap itself. This makes them perfect for beginner or amateur installers. I have to admit however that I only ever personally use them when I have to as I prefer the conventional lashing brackets and lashing wire. A 9” Cradle Ratchet bracket is very similar to an 8” cradle lashing bracket. It will safely support a mast of up to 4.5’ and accept a mast of up to 2” in diameter. This bracket is the equivalent of the 13.5 Cradle lashing bracket except the way that it secures to the chimney. It can support a mast of up to 6.5’ and 2” in diameter. The following are brackets not commonly installed but also serve purposes ever so often and you should know about them. A 6” self-supporting bracket secures around a brick on the corner of a wall of chimney stack and tightens in position. It cannot be used to support anything other than a small aerial and mast but can occasionally offer a solution when there are limited fixing positions. A tile & slate clamp can be used to support small aerials and satellite dishes and it is rather an ingenious idea. 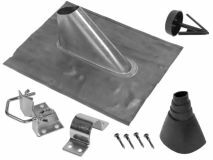 If all other fixing positions have been exhausted like mounting the antenna onto a wall or chimney stack a Tile & Slate clamp can be used. The clamp fixes around a tile and then the tile itself holds the bracket in place. Where height is required on an installation and no wall of chimney stack will get enough height. A through the roof and flashing kit can be installed to achieve this.The mast is inserted through the roof itself, usually is a central location and fixed to rafters and batons in the loft. A tile must be removed in order to do this and a lashing kit installed in its place weatherproof the installation. A 2” diameter mast must be used with a bung to prevent rainwater entering the building. 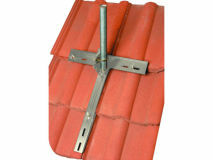 A non-penetrating roof mount can offer a fixing solution for flat roofs where no chimney of wall fixing is possible. The Non-Penetrating roof mount must be installed on top of an EDPM rubber sheet and is kept in position with 4x 450mm- 450mm paving slabs adn gravity ,however some mounts also exist that only require 2 slab. A patio mount can be secured directly on top of a surface, mounting it perfect for when satellite dishes can’t be installed onto a property, like with listed buildings. Four screws or coach bolts hold the mounting place. The mount can also be mounted onto a paving slab to keep in position. These types of brackets are most commonly used for satellite dishes where the wall mount is not include are in the shape of an ‘L’. They are secured to the wall with four screws/ bolts with arm pointing up. A TV aerial or satellite dish can be directly inserted onto the bracket. ‘L’ brackets come in various sizes for smaller and larger satellite dishes. That's it, for this one! As ever if you have any questions please LEAVE A COMMENT in the blog comments section below and I will respond to you ASAP. Please DO NOT CALL OUR TELEPHONE LINES These are reserved for customers only and no one is available to help you. I'm personally on installations and otherwise busy running the business. Please DO NOT E-MAIL either as I can't answer every single e-mail I get, often it's on the same subject as the last e-mail request I received. If you LEAVE A COMMENT in the blog comments section below everyone will get the benefit of the question asked and the answer given.